EULESS, Texas (Oct. 18, 2017) – Todd Sternfeld, construction company owner, entrepreneur, land developer, tiny house dealer and custom builder, and CEO of Superior Concrete Tiny Houses and Superior Concrete Products will be introducing another new cutting edge precast concrete tiny home – The Texas Two-Step — during the 2017 National Tiny House & Simple Living Jamboree in Arlington, Texas. The Jamboree which starts at 3 p.m. on Friday, Oct. 27 and lasts until 5 p.m. on Sunday, Oct. 29, will prominently feature the Texas Two-Step, a relocatable park model tiny house which has exterior walls made entirely out of precast concrete. Todd Sternfeld Brings Superior Concrete Tiny Houses — The Original Concrete Tiny House Co. to the 2017 National Tiny House and Simple Living Jamboree. 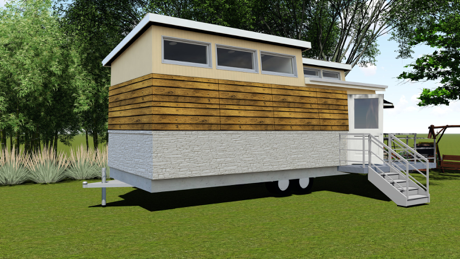 With 225-square-feet of well-designed living space, the Texas-Two Step is secured on a rugged steel frame trailer so it can be relocated to a home site, lake lot, tiny home community or other suitable location. The Texas Two-Step is built to be comfortable and functional while requiring little to no maintenance inside and out. With a front and a back door on opposite sides of the unit, this tiny home has ample room for two or more occupants, and a large loft has been added for sleeping and extra storage. The Two-Step also has a large front porch which provides additional outdoor living space and room for entertaining. For those who want to buy a tiny house, or are interested in learning more about the Superior Concrete Tiny Houses or Superior Concrete Products, or any of the company’s other state-of-the-art line of tiny homes, buildings, precast fence and retaining wall merchandise, phone 817-277-9255 or visit ConcreteFence.com and ConcreteTinyHouses.com. For more news on the 2017 National Tiny House and Simple Living Jamboree, go to TinyHouseJamboree.com.